Look at the face. Just look at that face. How could this little guy grow up to be Darth Vader? I mean, he had such a good start training with Obi-Wan Kenobi, and he showed so much promise when he married his childhood crush Padme, and...well, yeah, so there was that whole visions of his wife's death thing, that was a little worrisome. Maybe protecting your family is enough to push someone into the dark side, just to keep their family safe. But, that dark side was just too powerful, and pretty soon people start dying, and Obi-Wan fights you to the death, and...well, yeah. I guess I can see how that face could grow up to become Vader. 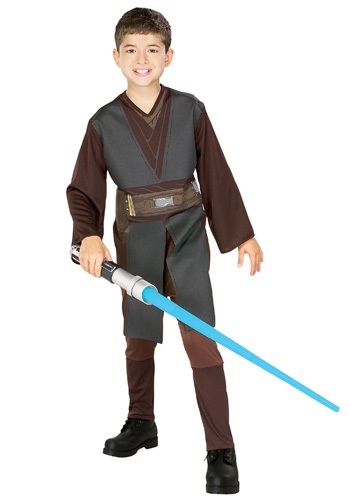 This costume is a 100% polyester blend, and features a dark colored tunic with details printed on the fabric and the belt. It comes with matching pants and boot covers that are attached and easily slip over shoes. We'd also highly recommend picked up one of our many Star Wars licensed light sabers to complete this costume.